It is the time of the year for the Zingi-bera-ceae (pronounced zinger-bera-sia) family to flourish and blossom at Her Majesty Queen Sirkit’s Botanical Garden in the hilly terrain of Chiang Mai, and the distinctive plants. Housed under glass in the greenhouse complex, these plants are commonly known as the pink and red cone ginger plants. And they are graceful attractions to the Botanical Gardens rainbow palette of colours and textures. Alongside red and pink cone ginger plants, other popular tropical plants in bloom are Siam Tulip, the Globba Winiti, and the Flame Lily. As a local official tells us more, this Botanical Garden is home to over 180 types of flowers in this family. The Queen Sirikit Botanical Garden boasts a full-scale research and development facility, as Thailand is home to over 300 species of plants in this Zingiberaceae family. Researchers have discovered their medicinal and herbal qualities, whereby members of the family are small to large herbaceous plants, commonly distributed in the tropics of Africa, Asia and the Americas, with their greatest diversity in Southeast Asia. “There are several benefits derived from plants in this family. Some exhibit anti-aging, skin whitening as well as anti-oxidant qualities. We try to bridge and mediate the interests of both botanists as well as encourage locals and those related to create an economic value from these fascinating products from nature,” Piyakaset said. 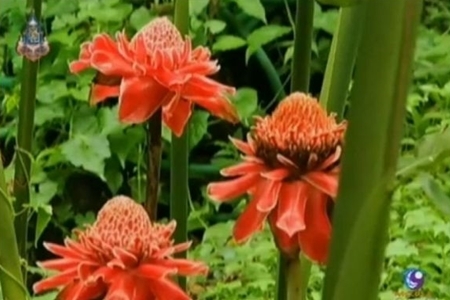 With its ability to generate over 40 million baht per year from exports of pink and red ginger cone ornaments alone, both business and botanical experts alike view that there is potential for future market growth. Through channels such as the Botanical Garden itself, it aims to assist in generating knowledge by hosting seminars, with hopes of spurring more interest for those involved. Yet beyond creating a market value for these beautiful species, it is equally important to ensure that the growth of the botanical industry in Thailand will grow sustainably.